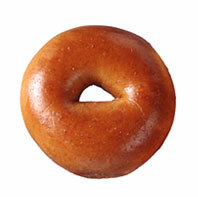 Do you bounce out of bed on free-bagel Friday?! What is it about those round wonders that gets us pumped for the ball & chain? Could it be the ingredients?… high-gluten flour, salt, water, yeast, and malt. That must be it: Drop the flour, and you’ve got beer. Or, is it the condiments? The tower of cream cheese, drippy margarine, or peanut butter & jelly combo. As for toppings, reduced fat cream cheese saves you 50 calories & 6 grams of fat, but still adds 130 total calories to your circular sammidge. To go even lower, top your toasty with jam, which adds only 70 additional calories. And how about this?! Hollow-out or “scoop-out” the bagel guts and save yourself 75 calories! How did YOU eat it this morning?